Fireworks. Some people love them. Others hate them (and for valid reasons). A few have a love/hate relationship with them. Regardless of where you stand on the issue of fireworks, there really isn’t a whole lot we can do about them. They’ll be let off no matter what. So let’s talk about fireworks! LOL! I happen to be one of the people that love to go and watch fireworks. Not just any fireworks, though. I like the ones that are set off by the professionals. You know, the type of fireworks displayed during 4th of July or other festivals. The ones that go higher in the air, get bigger, and sound louder than anything we could buy at the store (if your state allows for that). As for the ones you get from the store, they’re okay. But they provide a little bit of anxiety for me. I like to see them, but get a little nervous when just your ordinary joe fires them. Why? Because many accidents happen, and my mind immediately fears the worst. (Something I know I need to work on). The thing is, though, since Michigan made fireworks legal a couple/few years ago, some people do some pretty scary stuff. Not scary when you’re expecting it. But scary when it comes out of nowhere! Just this past 4th of July, my family and I were walking down the sidewalk to the park to find a place to sit and wait for the fireworks to start. As we were walking, minding our own business, BOOM! From nowhere, this bright flash of light and bomb-blasting sound about made us fall backward. I kid you not. In the city, where houses are really close, this took place. Scared us silly! In Michigan this can happen. We are allowed to buy and light fireworks the day before, day of, and day after the holidays. We can do them until 1:00 a.m. in the morning. Many people don’t abide by this rule, but it is what it is. I think the 1:00 a.m. rule is a bit late. I mean, the kids need to sleep (as do I). Thankfully since we’ve moved, the new location doesn’t keep them going all night long, but we’ve been in places where they have. And it’s just ridiculous. Though I’ve complained a lot now (sorry), I really do like fireworks. I especially like the ones that Grand Haven throws during 4th of July and the Coast Guard festival, which took place just one month ago. They really put on a good show! My favorite fireworks are the ones that are big and colorful and/or sparkly. I do not like the loud ones. I see no purpose in the loud flashes of light that only serve to deafen you. I want color and beauty. Some of the best that we have seen are the smiley faces, tulips, and rings around a gorgeous center. I also love the big golden ones that fall over like a weeping willow because they remind me of show business. And a cool thing is that sometimes there is a slight pause between the show and the grand finale. It reminds me of concerts where the musicians pretend to be done, but then come back for one more hit song. They really know how to leave us wanting more! 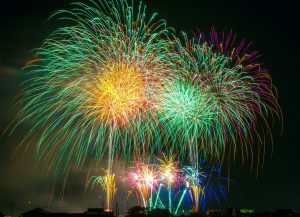 Anyway, bottom line is that I think in the right hands at the right time and the right place, fireworks are beautiful. You never know what you’re going to see next, which I find thrilling. Any chance I get to see a show, I do. How do you feel about them? Do you like the loud ones? Bright ones? Colorful ones? Do they even light fireworks where you live? Can you buy them all year around like you can in Michigan? What was your favorite show? Or firework? Maybe in the comments you can show a picture of your favorite!